Today saw some moderate follow-through in stocks and it is also the month end. 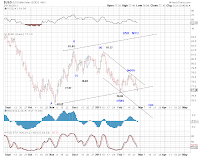 The USD index suffered another down tick - tracked by the chart in Wither the Dollar discussion in Bull market, B-wave and Beyond (2/18/11). 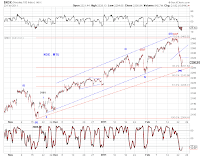 Stocks took out the 0.618 retrace early in the trading session and closed ABOVE it. 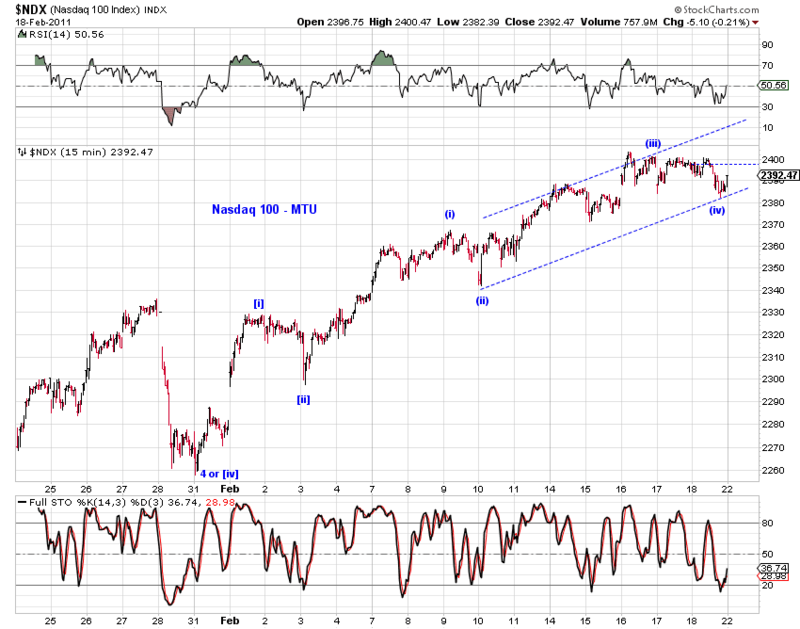 SPX also closed ABOVE the 10-day MA. There's some relative weakness in Nasdaq indexes as they attempted to fill the large initial gap during the recent "crash". 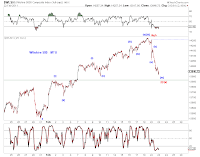 Regarding wave counts, today's AM high is likely wave [i] or (a) as indicated. Depending on how one labels a potential triangle (red, black) or even a 1-2-1-2 structure, the upside ranges from bearish, moderately bullish to quite bullish. ES has reached a 0.618 retrace. Russian RTSI made new high overnight. 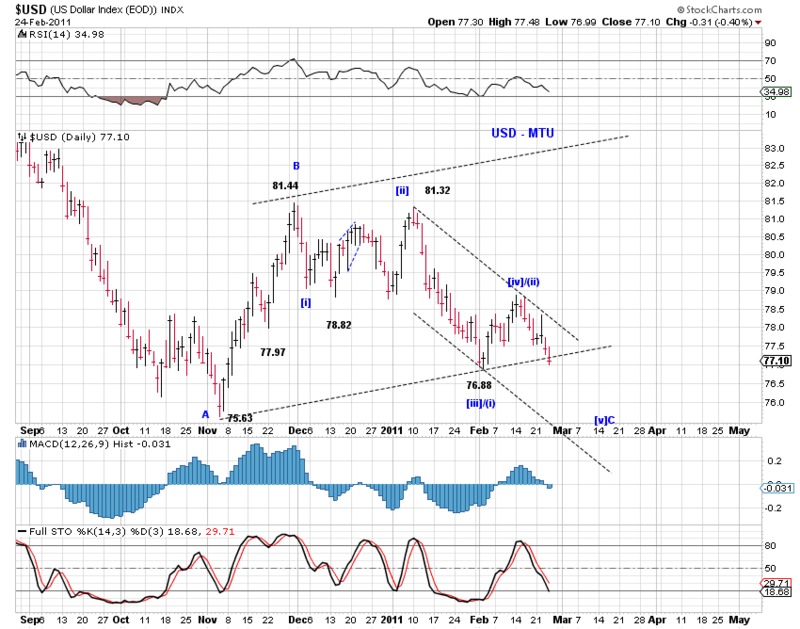 A five wave wedge shaped decline in the USD index - if it does not extend. 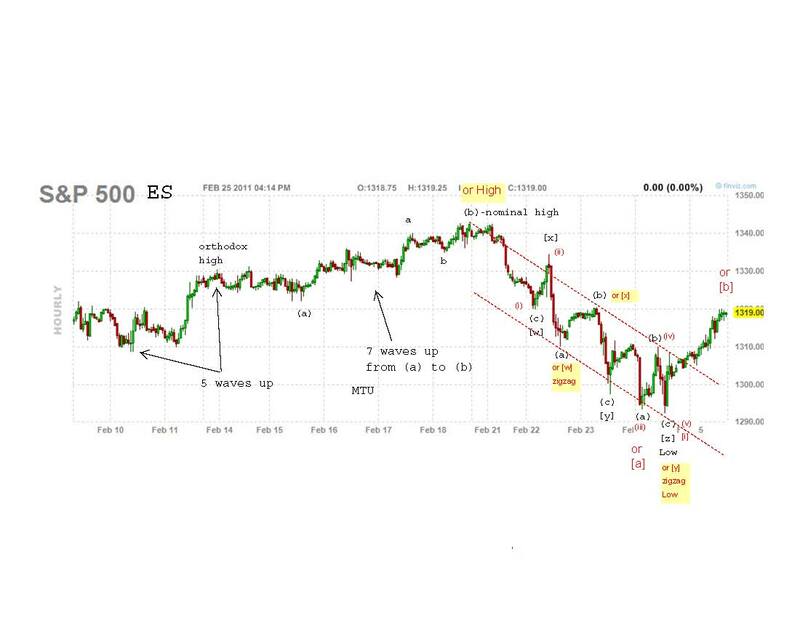 The analysis in Bull market, B-wave and Beyond (2/18/11) warns that "one should be cognizant of the risk of a logical ending point ahead" based on wave structures and the arrival of the first Fibonacci time turning point. The market has certainly delivered a swift drop this week (down 3.71% in SPX over three days), but also an equally impressive rebound from Thursday's low (up 2.04% in SPX to Friday's high). 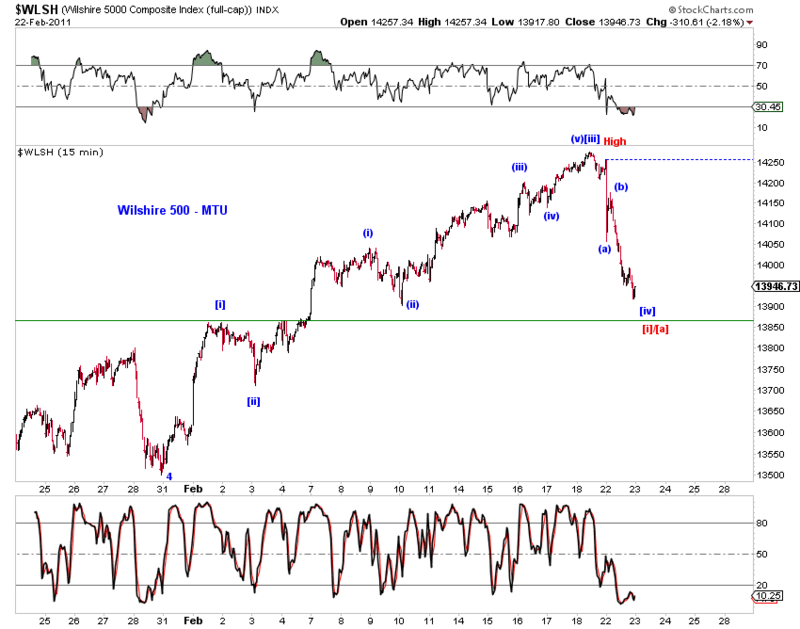 The broad market, as measured by Wilshire 5000, has now retraced a little more than 50% of its recent decline. 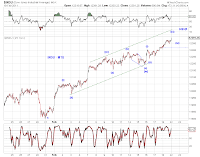 Is the correction over and the next advance to a new high already in progress? 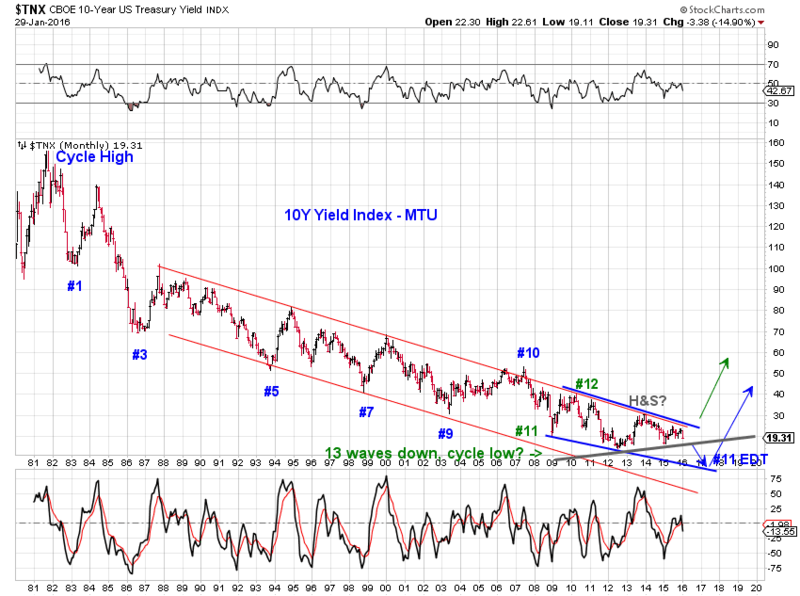 Will there be follow-through to this week's decline to a lower low? This week's low has now become a critical level. 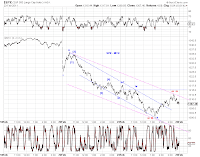 On balance, risks to either the immediately bullish and bearish interpretation remain substantial. 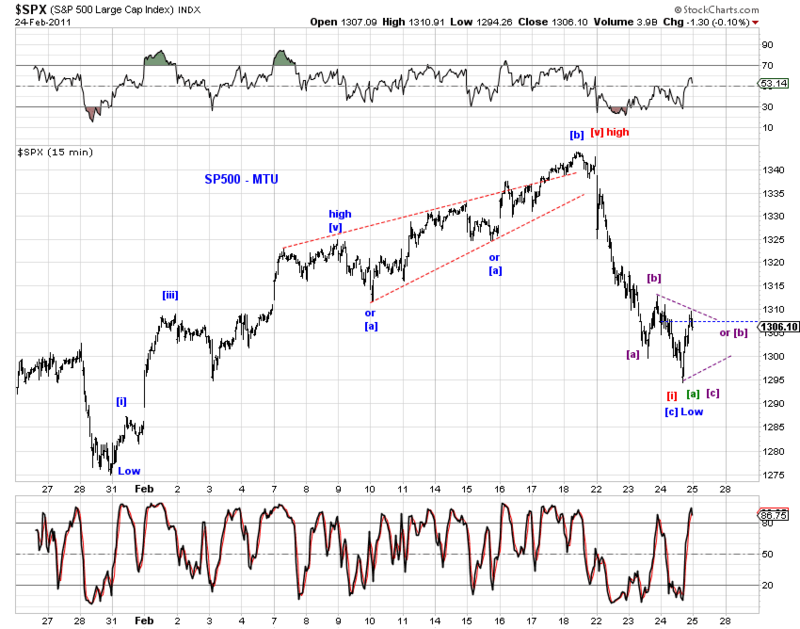 For bulls, the hope rally could have ended at the recent high (Chart 1, red count). For bears, the market may have started another multi-week/month advance since the recent decline may be large enough to be considered a correction at the minor or minute degree (Chart 1, green and blue counts). However, risks are not overwhelmingly skewed in either direction. But here are some observations to consider. 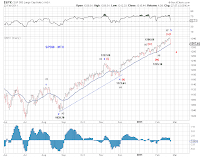 The 50-day MA has successfully supported the broader stock market and stocks rebounded sharply. 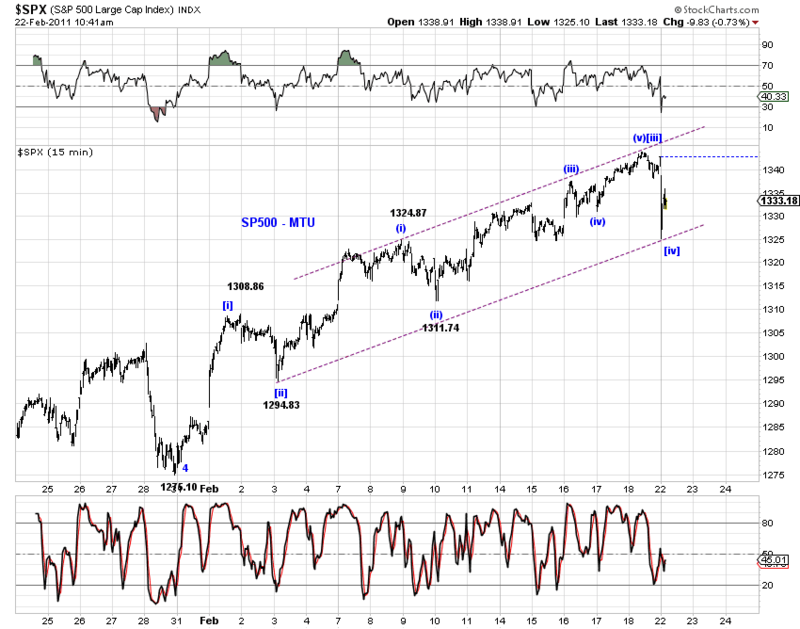 There is no major lower lows (yet), implying that the uptrend remains intact. With the exception of INDU, other indexes closed above their 20-day MA Friday. 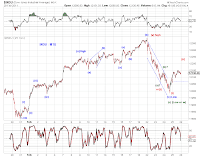 Market internals (Chart 1) are respectable on the rebound Friday. 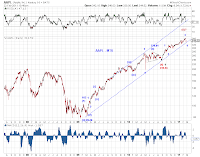 The NYSE advance/decline issues ratio is comparable to the beginning of the next bull run following a prior pullback (light blue vertical lines) - with the exception of one instance in late November (light orange vertical line). 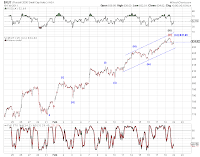 If the market goes to a new high, the blue and green counts in Chart 2 offer the associated wave structure. 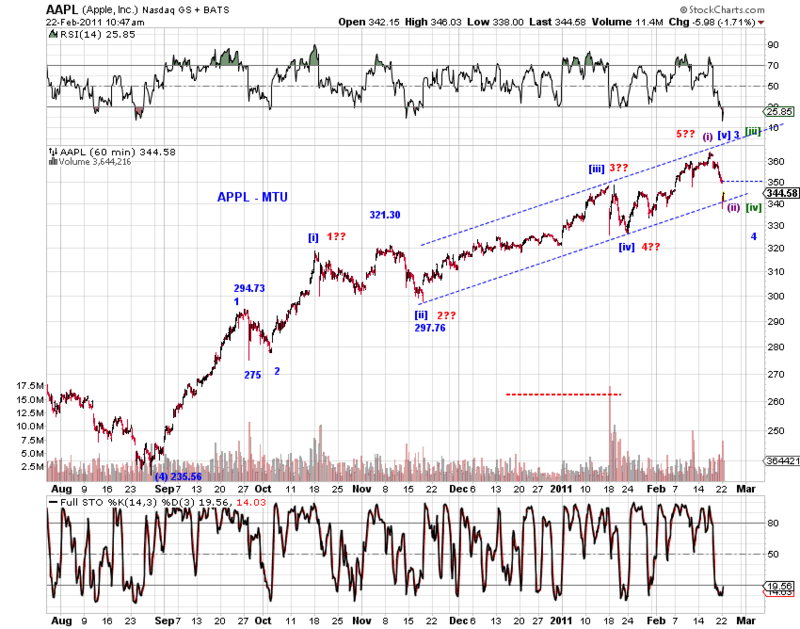 The blue count describes the decline as a zigzag, which works OK with cash indexes but not with futures. The green count describes a complex correction (e.g. a running flat-like structure) that has actually started in mid-February (or even earlier), which works well with futures and INDU, but OK with the other cash indexes. 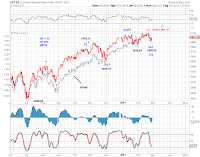 Note that the interpretation of the sell-off as the tail end of a larger sideways correction may not be too far fetched if one compares US with Russian RTSI (Chart 3) and UK FTSE (Chart 4), which have shared a high correlation with SPX for some time. 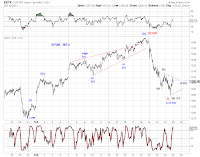 Near term wave structure shows a respectable impulse wave decline, with the rebound potentially being an expanded flat or a zigzag (Chart 2, red count). A nine-wave decline is the clearest in Dow futures. If last Friday's high is indeed the start of the correction, the first impulse wave is never the end of the correction. 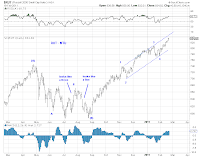 Friday's rebound may be a successful retest of the underside of the upward trend line (Chart 1, blue dotted line), before the sell-off resumes early next week. 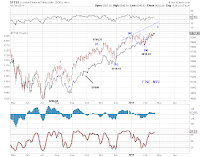 Chart 6 presents 2 immediately bullish counts (which addresses the minor overlaps) and 2 bearish counts on ES (SPX). One can map these onto YM (INDU) (Chart 7). The wave structure in futures are informative (or blurring the cash counts). 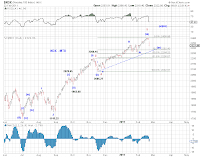 The bullish and bearish counts are presented in the NQ chart. 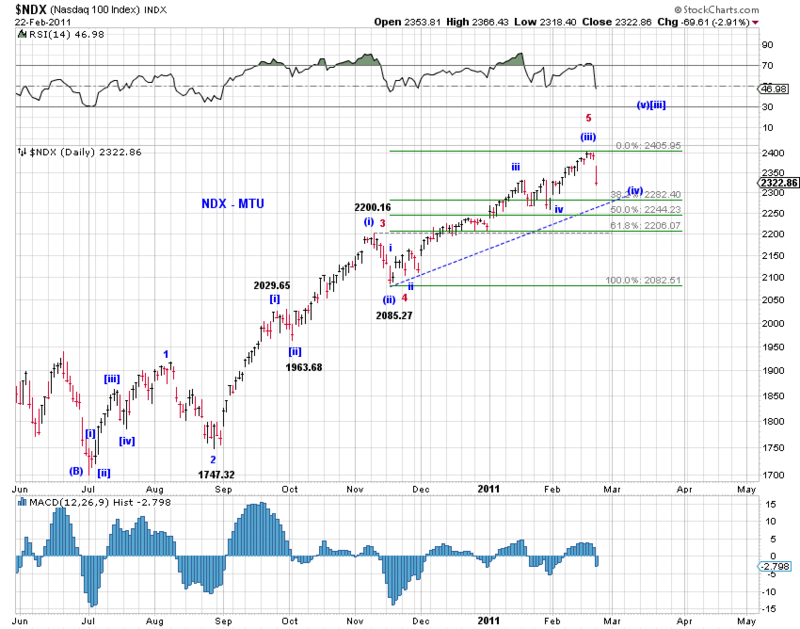 If we have an expanded flat in ES (or SPX, INDU), we need to recognize the initial 7-wave decline that implies an overall corrective pullback - no P3-down yet. 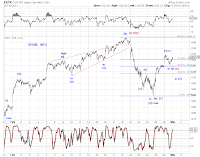 If the nominal low in ES (or SPX, INDU) is [i]-down on a 9-wave decline from the nominal high, either we're missing (b)-down and (c)-up or the advance since the low is less impulsive in its structure than assumed (in the expanded flat case). Stock futures reached 0.382 retrace. 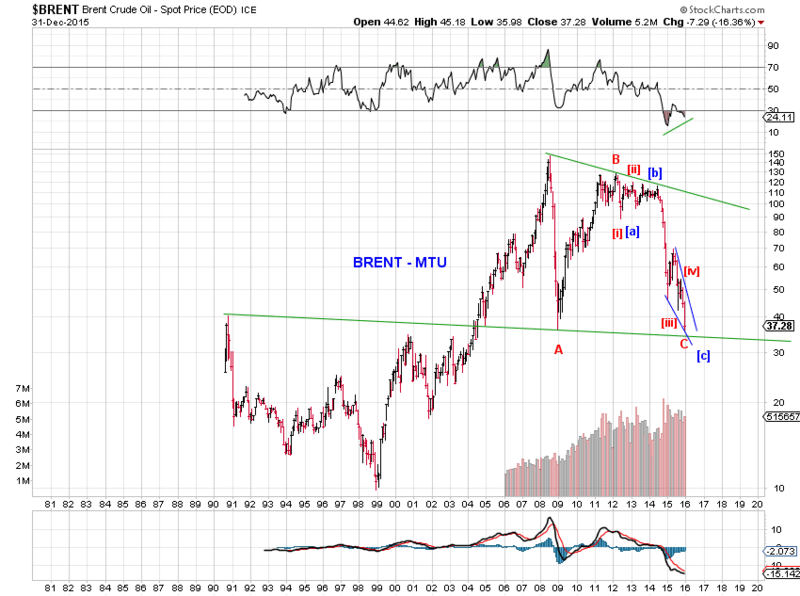 The chart to the right updates the tracking count for USD as discussed in Bull market, B-wave and Beyond (2/18/11). Please see the larger count there. 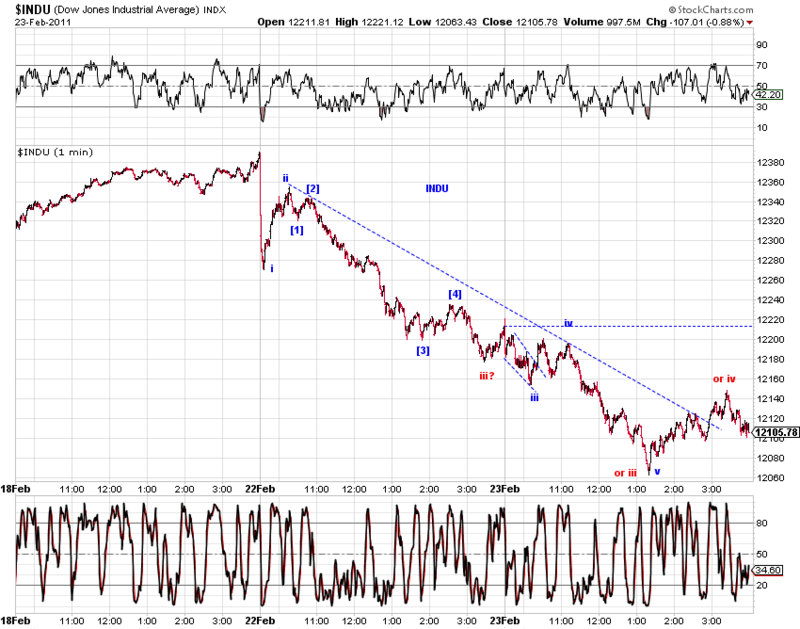 Futures has the clearest structure of a likely completed impulse wave decline. There has been some minor overlap of the waves in ES, but not in YM. 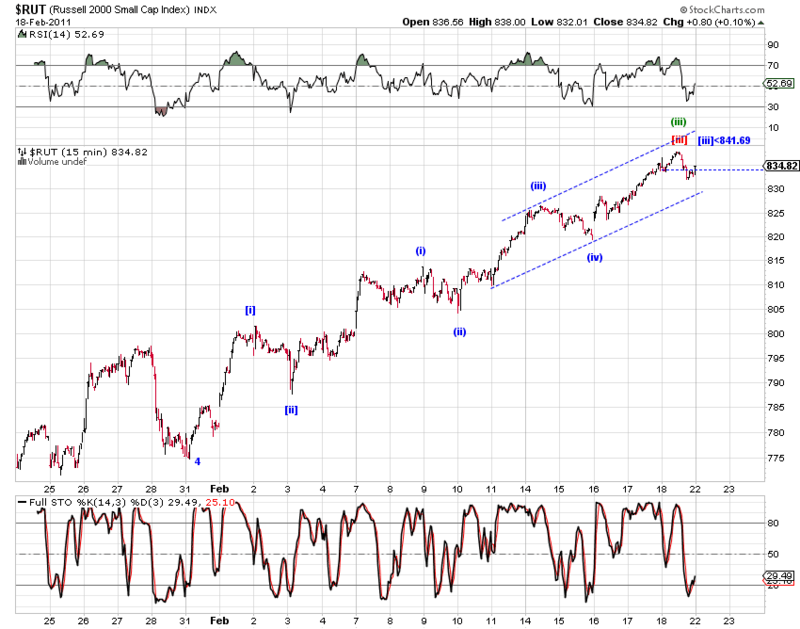 However, the rebound from today's low is yet to produce a higher high. Various tracking counts are shown in the cash charts. Interesting divergence among indexes - YM makes new low while ES, NQ do not. 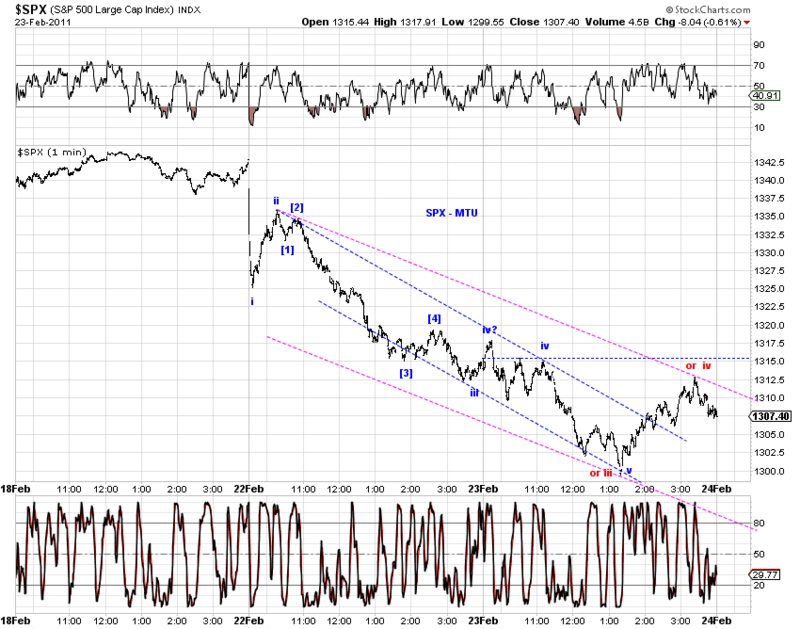 New low overnight in stocks, netting a 7-wave decline from the high. There are minor overlaps in each wave in ES, but not in YM. An impulse wave decline from the recent high likely has ended at today's low, particularly according to the wave structure in the futures (Chart 1). 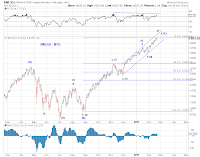 The wave structure of the cash index raises an alternative possibility of a small-degree fifth wave decline yet to play out (Chart 2, red count), although it may not be necessary (Chart 2, blue count). 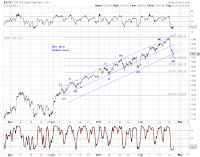 For those who think that the sell-off is the start of at least a larger correction, the decline to date is most likely wave [i]-down or [a]-down. 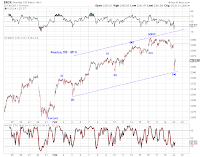 The sell-off should resume after a counter-trend rebound. For those who think that the sell-off is done or nearly done, the following counts offer some food for thought. 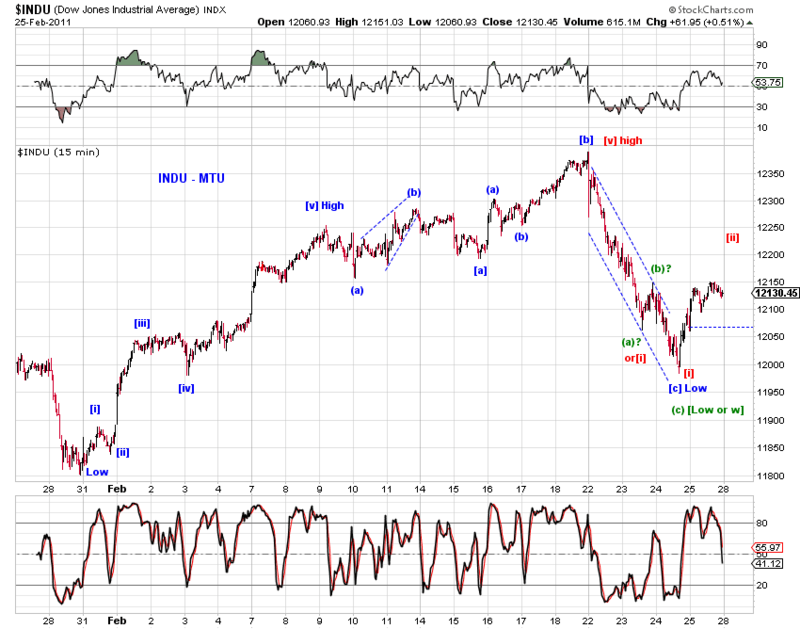 These are immediately bullish (or nearly so) counts in SPX, INDU and NDX. The blue count in Chart 1 on ES presents the same idea. First, some thought on the larger picture. 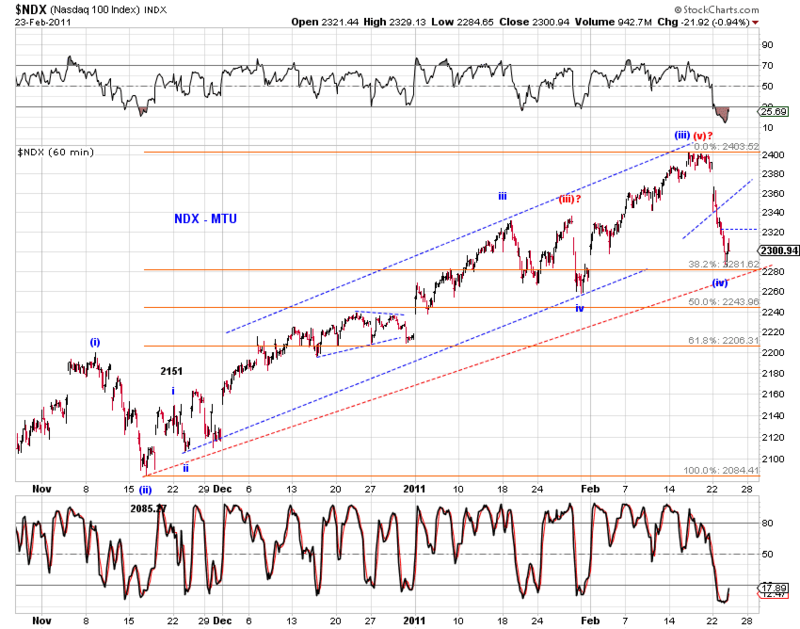 As discussed in the weekend piece, we are entering a 0.236 Fib time month for a potential turning point. 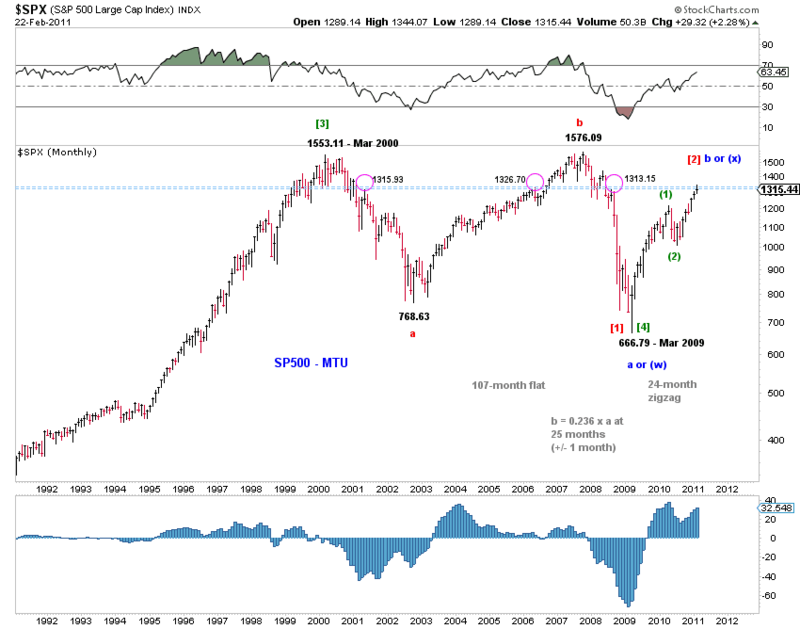 Also note that SPX has managed to stay above the decade-long resistance zone for only three days so far. Today's low is below the zone and today's close is at the lower end of the zone range. A rejection? An attempt to break out still in progress? We shall see. Second, some observations for the near term. 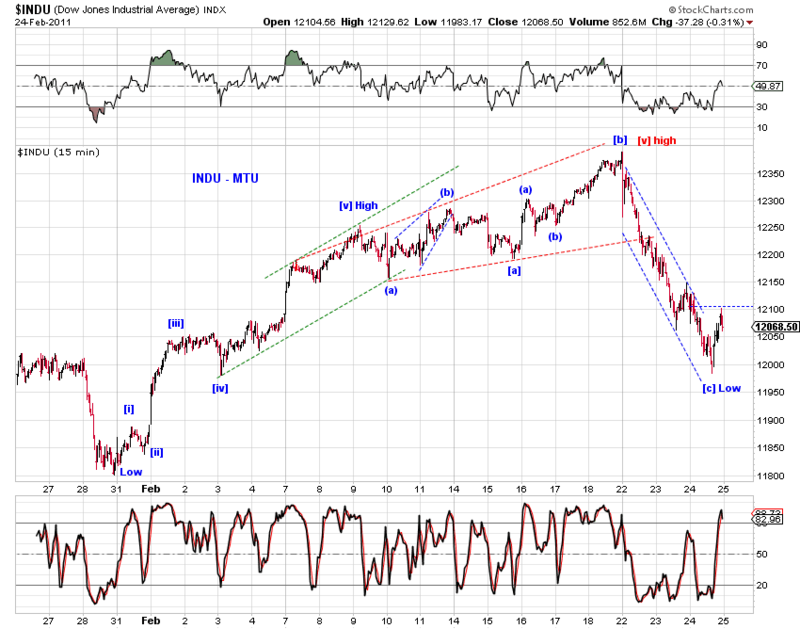 The decline so far is likely too large for it to be a small-degree fourth wave since the January low. 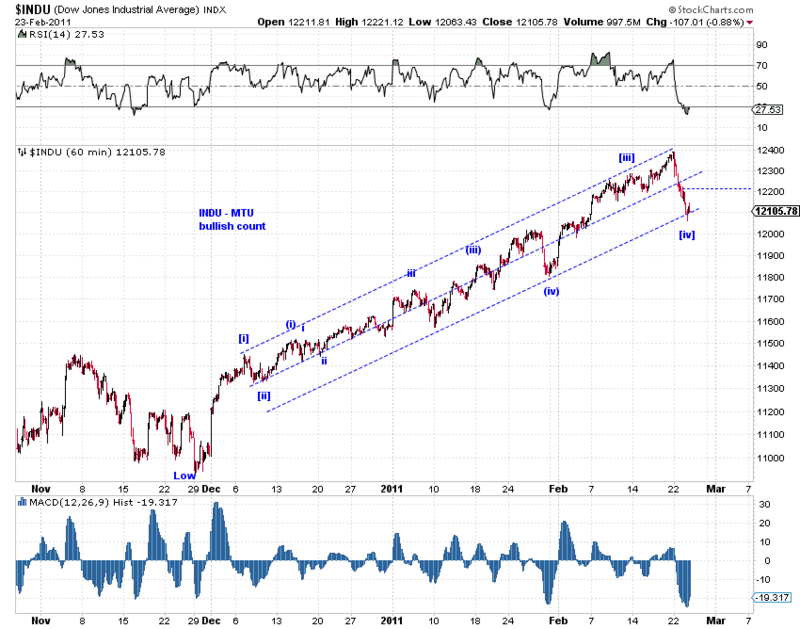 Moreover, today's low in NDX overlapped its first wave advance since the January low, offering a strong hint that the advance since then has ended (barring a pretty low probability event of a contracting triangle developing in NDX). 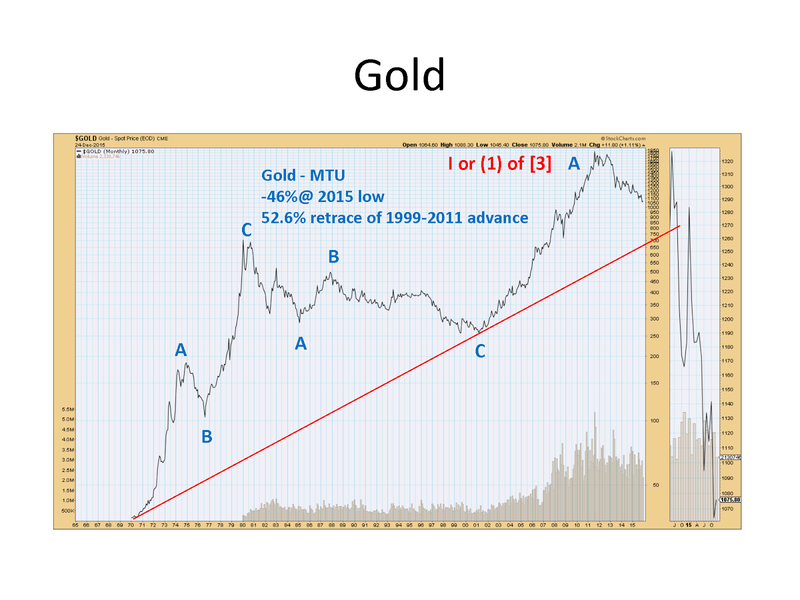 So odds favor at least a correction at a larger degree (see Chart)- much larger? 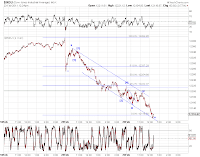 However, the decline being a part or all of a small degree fourth wave correction remains technically possible but (much) less probable than before. 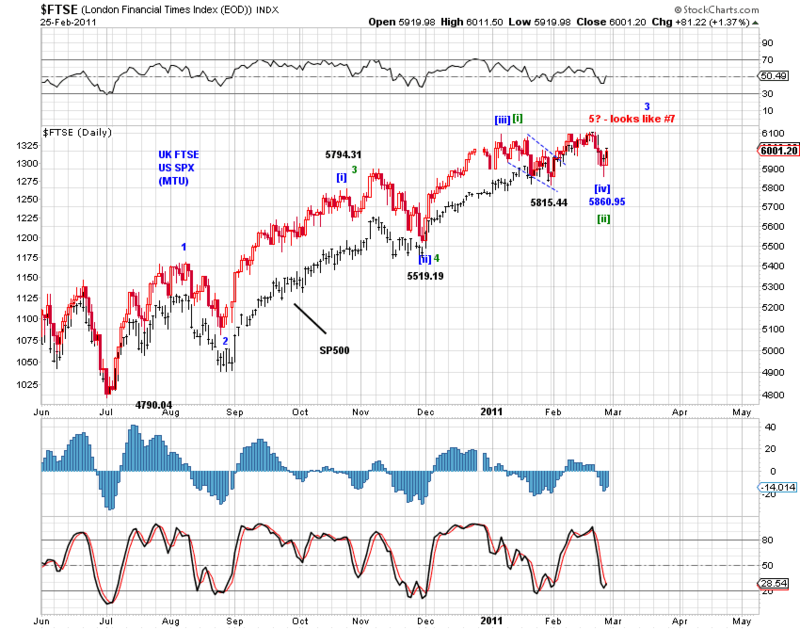 See the following charts on WLSH and NDX. The structure of the decline from the high remains uncertain, both in cash and in futures. 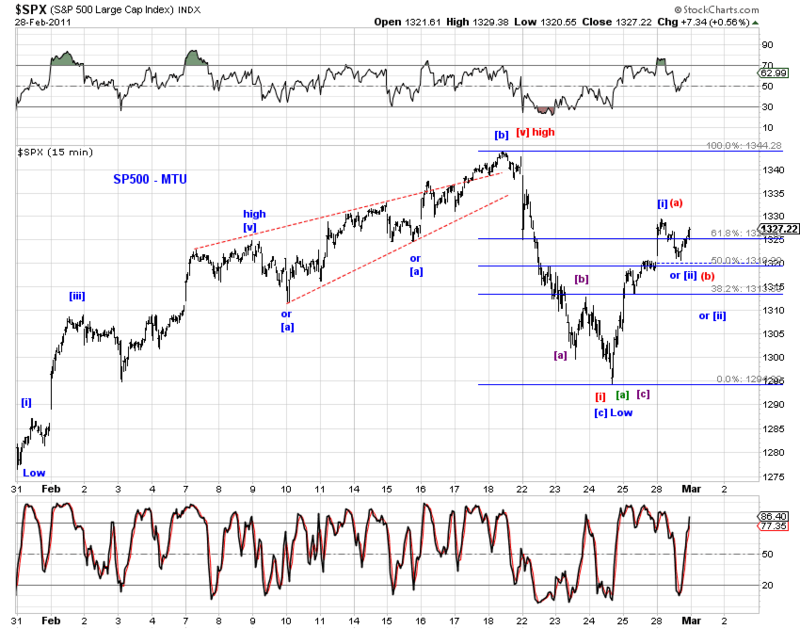 The following chart shows a corrective count and an impulse wave count on ES. 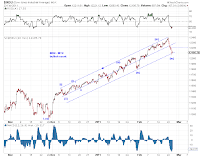 There's a relatively clear three-wave decline in futures so far, while there could be a five-wave or seven-wave decline in cash indexes to today's low. Tomorrow's price action should be informative. 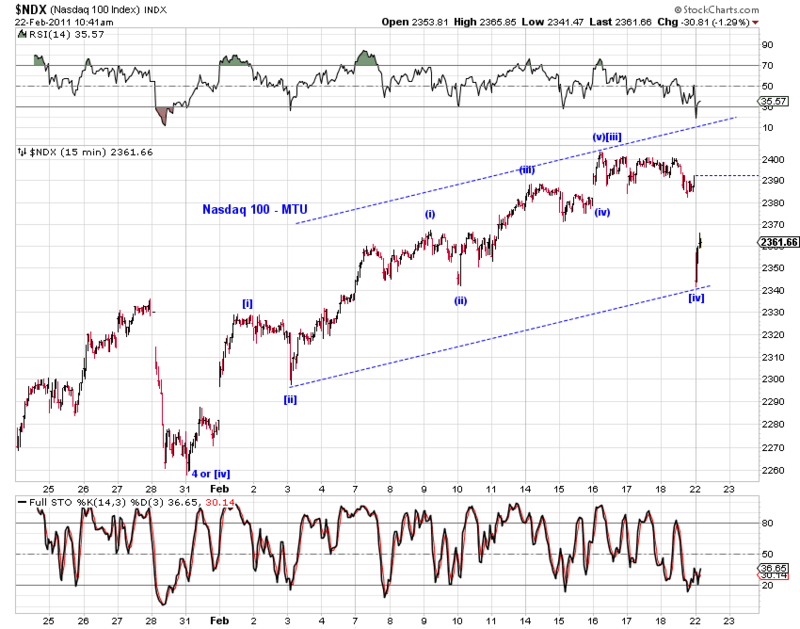 This short term count on NDX is a close call. However, if it fails, it pays to keep the larger structure/count in mind. 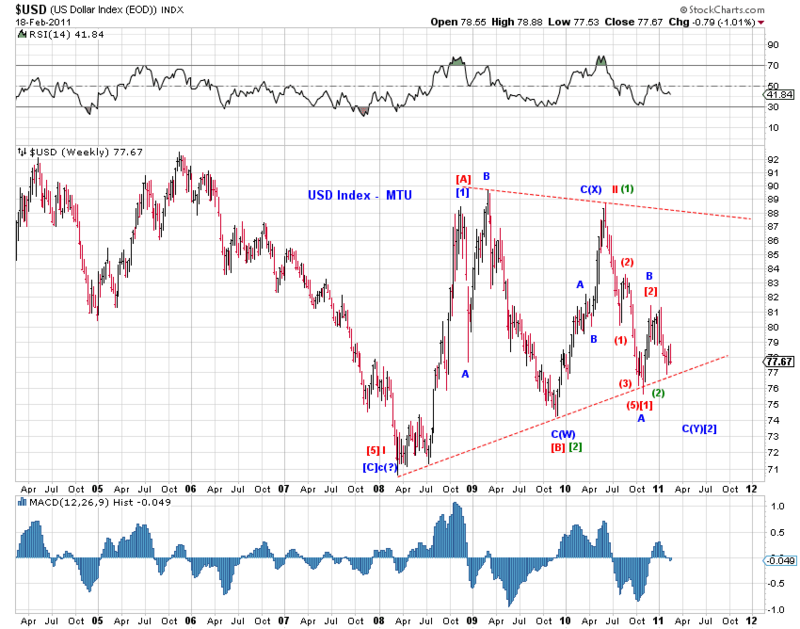 Please see Bull market, B-wave and Beyond(2/18/11) for intermediate/long term count on the USD index. Archived at MTU Real Time. 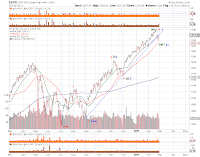 A Potential x Wave (2/4/11) and Logical Ending Points (2/11/11) - the current assessment is that the broad U.S. stock market is tracing out a b-wave (for a better pun, technically a likely x-wave) of cycle or super-cycle degree (Chart 1, blue labels). The challenge of this particular b-wave/x-wave, which began after the 2000-2009 expanded flat, is that it can end at the completion of one or a combination of three-wave corrective structures, either below or above the 2007 high as discussed in Logical Ending Points (2/11/11). 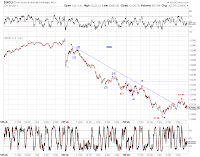 Note that the advance since the 2009 low in broad indexes (such as $WLSH, $SPX and $INDU) is visually a three-wave structure (Chart 1, blue labels). Moreover, the first Fibonacci time turning point at a larger scale is also approaching. The hope rally has lasted about 24 months to date. 0.236 times the 2000-2009 decline is 25 months (+/- 1). 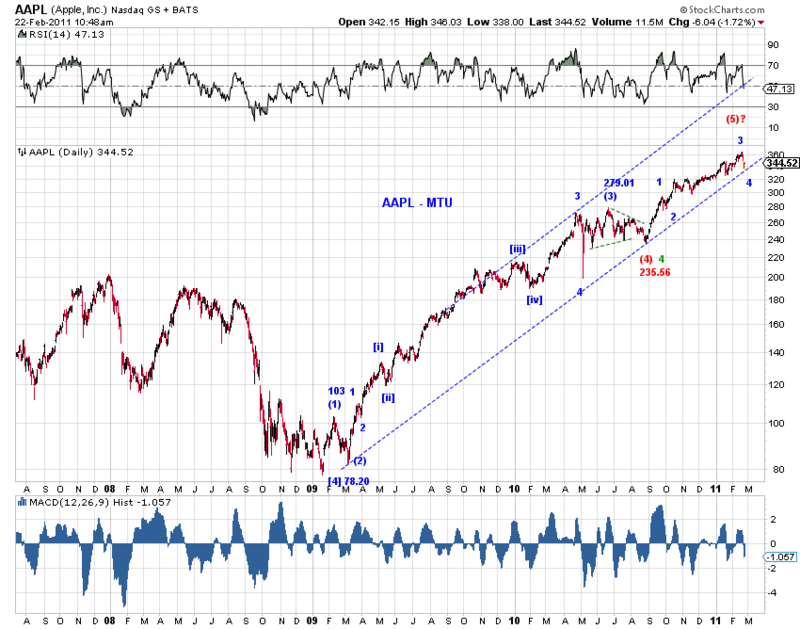 The next turning point, at 0.382 times, is around late 2011 to early 2012. Thus, one should be cognizant of the risk of a logical ending point ahead. At the same time, one keeps an eye on the two less likely but respectably probable scenarios - the much discussed bearish P count (Chart 1, red labels) and bullish P count (Chart 1, green labels). 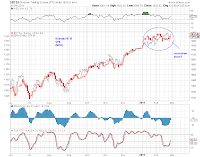 In either case, the market has entered a critical phase where the bearish P count calls for a reversal in the not too distant future, whereas the bullish P count calls for an accelerated advance before long. 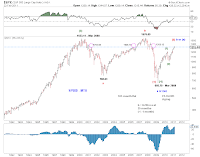 The key challenge to the P count is a deep retracement and several indexes having already exceeded their 2007 high (see Chart 2). The key challenge to the P count is that current bullish sentiment does not favor an accelerated advance. These challenges add to the merit of a b-wave / x-wave interpretation. 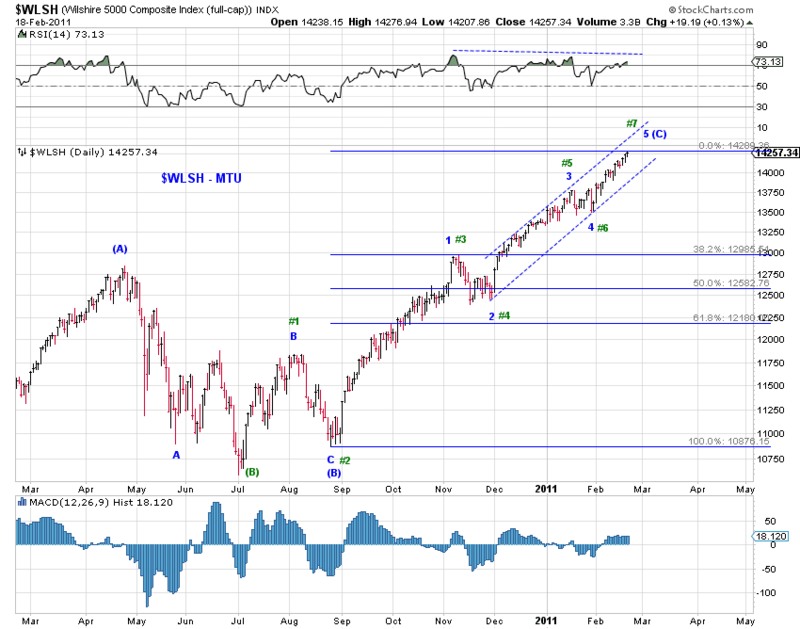 Taking into account of the wave structures in a basket of indexes such as those in Chart 2, one finds 5 waves since the late August 2010 low (Chart 3, blue labels) and 7 waves since the July 2010 low (Chart 3, green labels), using Wilshire 5000 as a proxy. 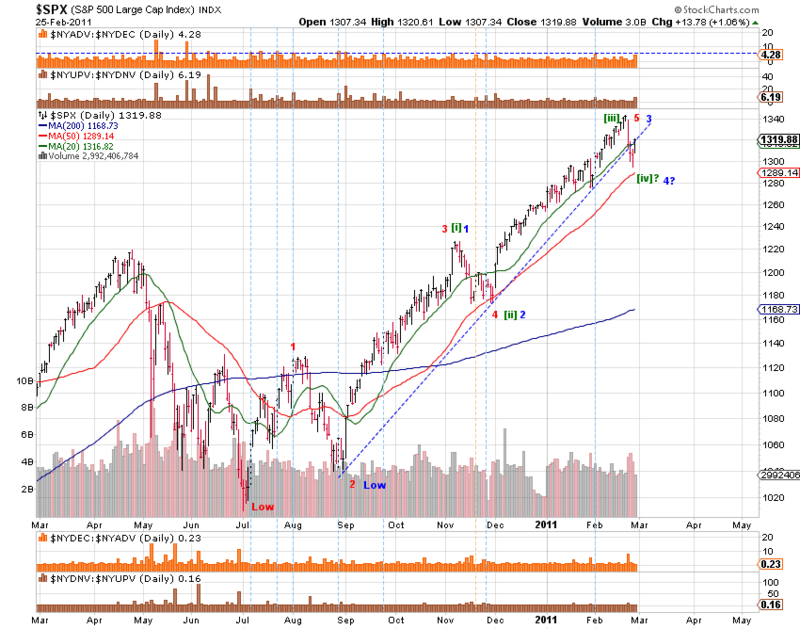 Regarding wave labeling, it's sensible to treat the late August 2010 low as the orthodox end to the correction from the April 2010 high (Chart 3, blue labels). 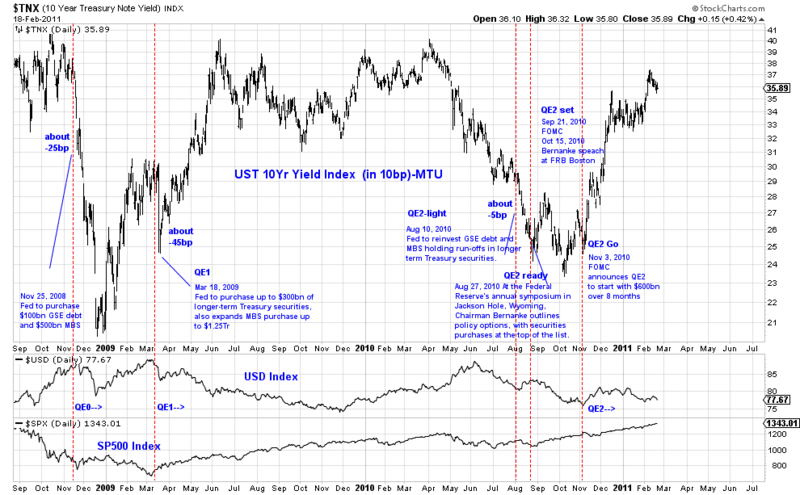 After all, the sell-off into late August 2010 was likely truncated by the great QE2 front-running (Chart 4). The Russell 2000 index may be the one domestic index with the clearest wave structure to support this particular wave count (Chart 5). 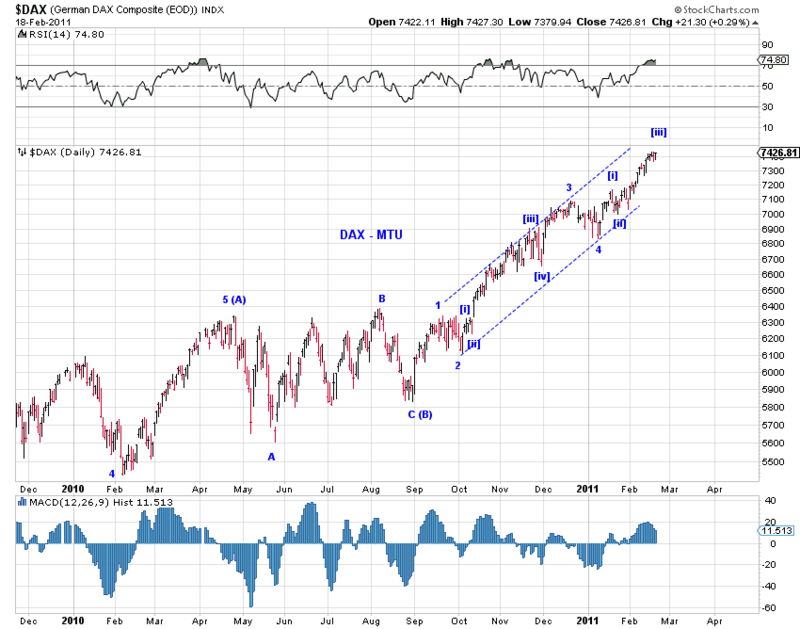 The same count tracks the German DAX well so far (Chart 6). The implications of this particular count are two-fold. First, this particular count accommodates the b-wave, P and P count alike. It allows the b-wave count to terminate or a meaningful correction to serve as a connecting wave if this b-wave develops into a combination. 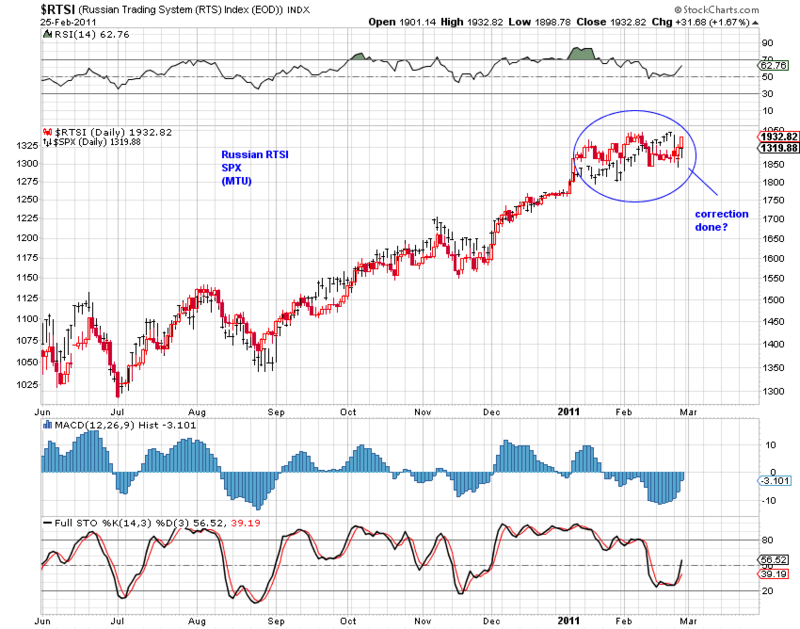 It allows the P count to terminate below the 2007 high in broad market indexes. 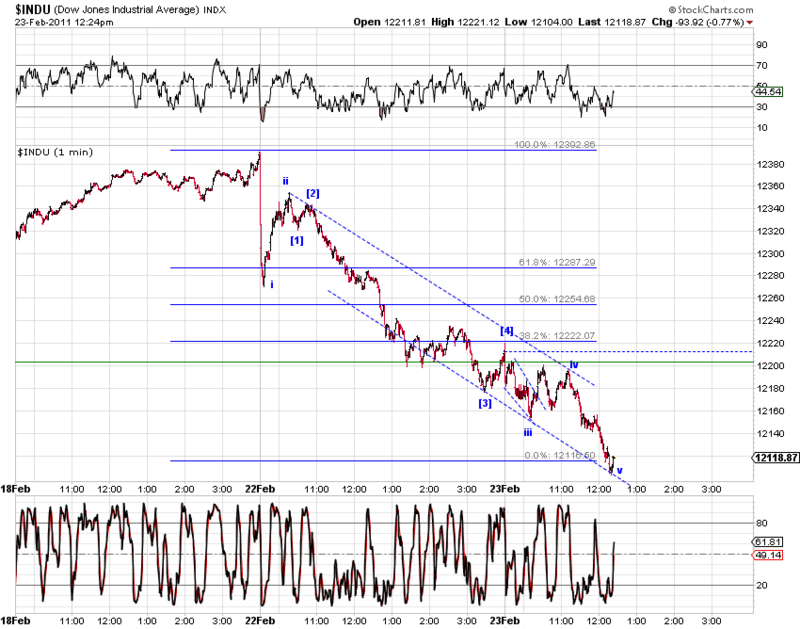 It also allows the P count to have its wave (2) pullback to alleviate the prevalent bullish sentiment. 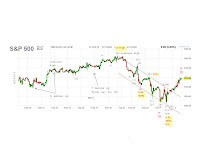 All three scenarios, under this wave labeling, call for a meaningful pullback to correct the advance the late August 2010 low. 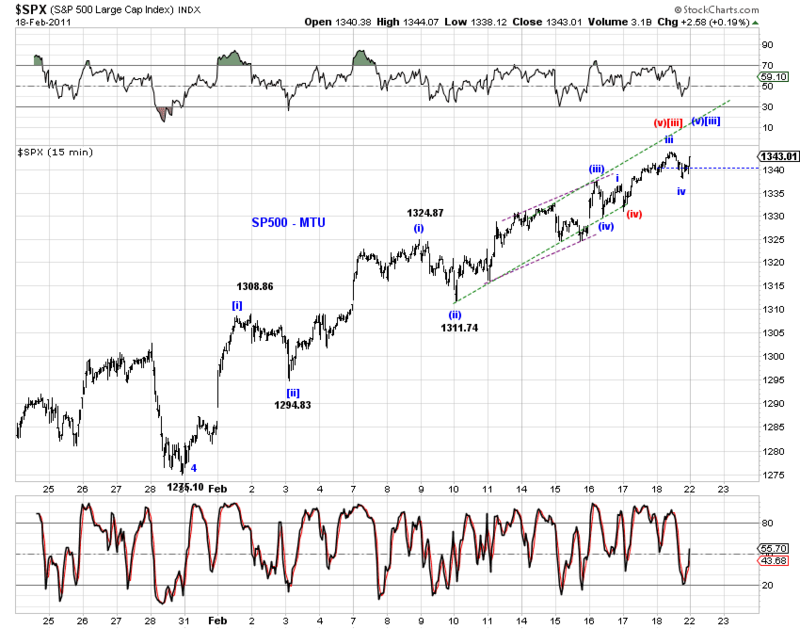 Second, the late January low is a critical pivot. 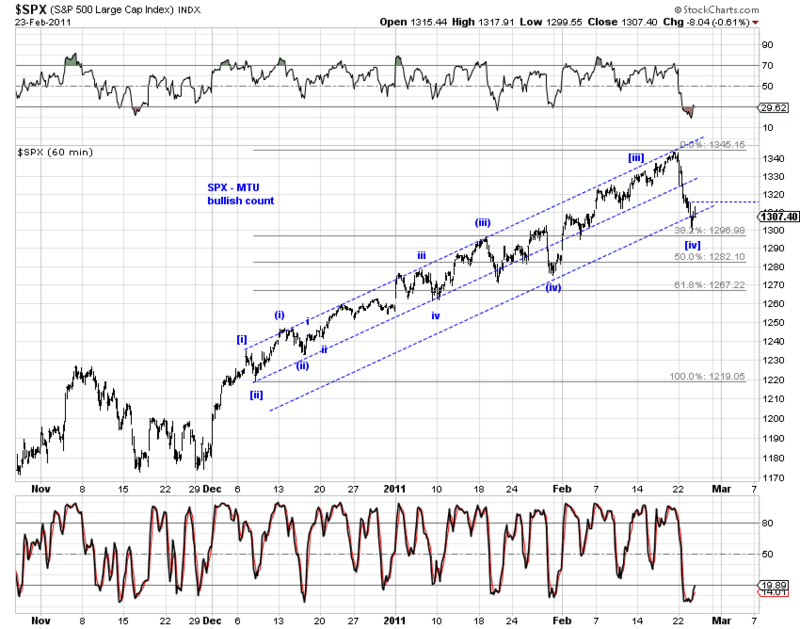 In theory, the top is in when an impulse wave (likely 5 waves) ends from the January low. Fortunately, since wave 3 is shorter than wave 1 under this interpretation. Therefore, there exists a cap to any upside potential. This cap also serves to invalidate this count when exceeded. In SP500, this cap is 1397.52 (and 1404.13 max). 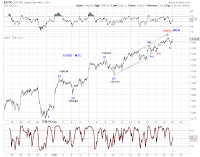 Note that wave 5 reaches 0.618 times wave 3 at 1350.76 (or 1354.85). 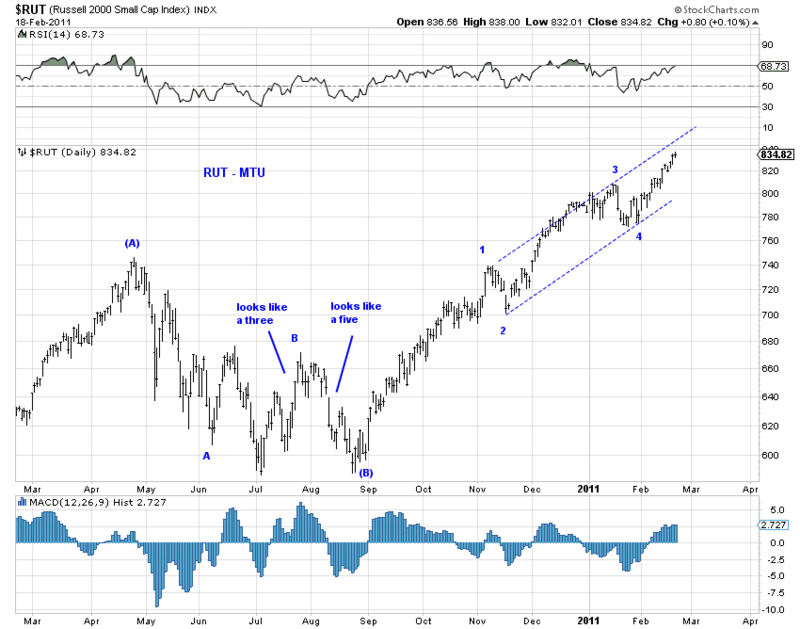 Alternatively, if the nominal low in July 2010 is indeed the end of the correction since the April 2010 high, wave #7 is currently in progress. Once wave #7 completes, wave #8-down and wave #9-up will follow. 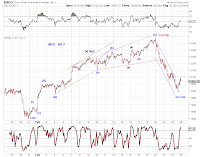 The wave #8 pullback is likely moderate. 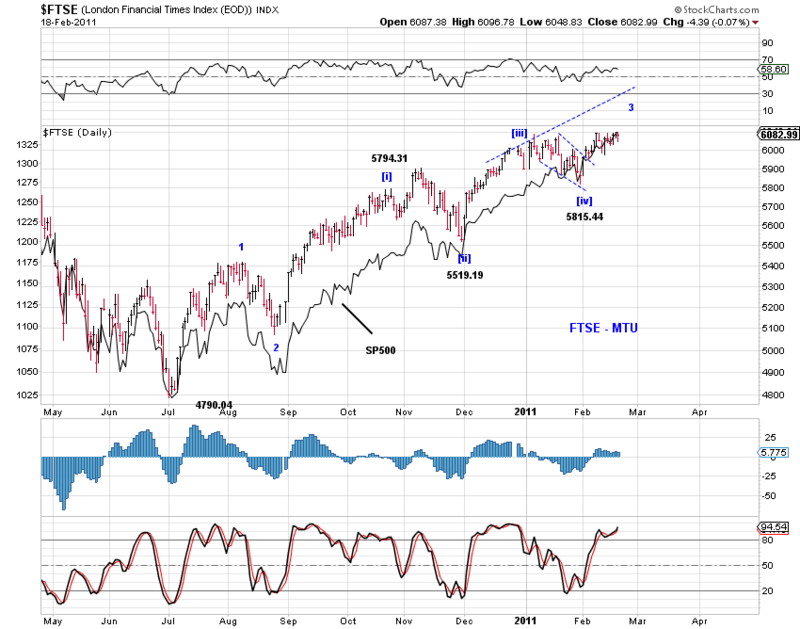 This count tracks the UK FTSE, which historically has a high correlation with the SP500 index (Chart 7). 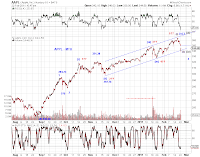 As discussed above, the January low is a critical pivot under the proposed wave count on the QE2 rally. 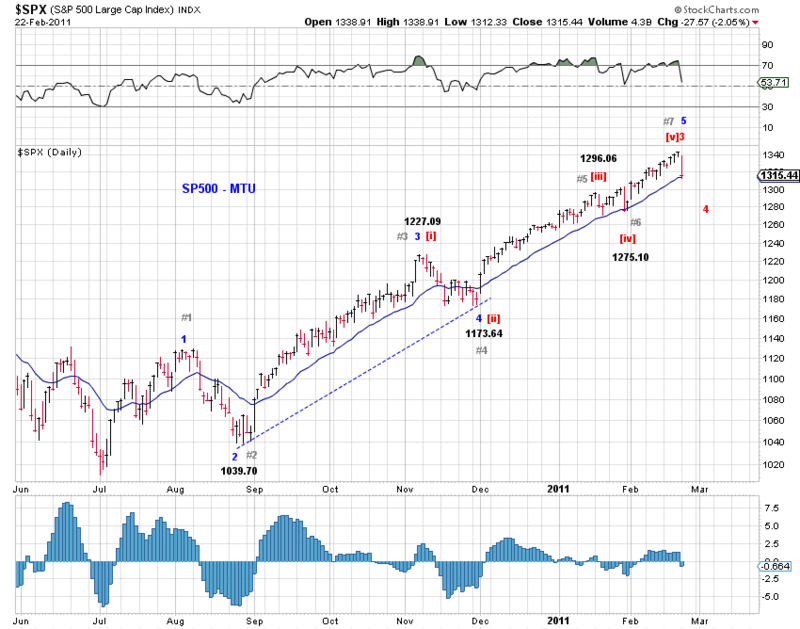 The real challenge, therefore, is to correctly track the impulse wave advance since the January low and identify its top. 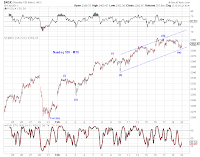 The near term wave structures in major indexes, however, have become more dissimilar lately. 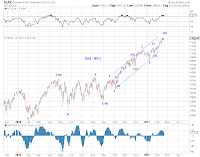 To some extent, this divergence is a logical reflection of a relatively weak fifth wave if the proposed count is correct. The task at hand is therefore to analyze each index individually. I will highlight the primary count for each index below and omit the alternative counts for now, but one needs to keep an open mind. Here we go. 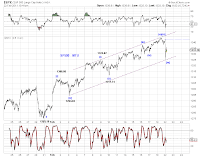 SPX and WLSH (Chart 8) are tracing out an extended wave [iii], while INDU is tracing out an extended wave [v] (Chart 9). Small caps appear to have more upside potential than do large caps. 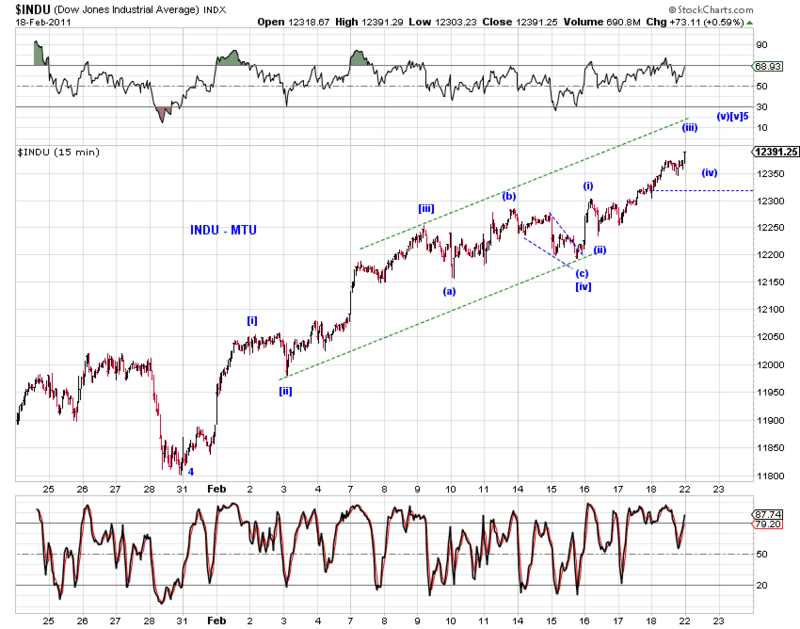 Both NDX and RUT are tracing out an extended wave [iii] which is yet to finish (Chart 10 and Chart 11). 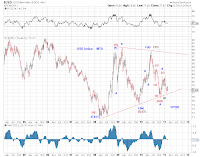 The primary count on the dollar is bearish for the intermediate term. 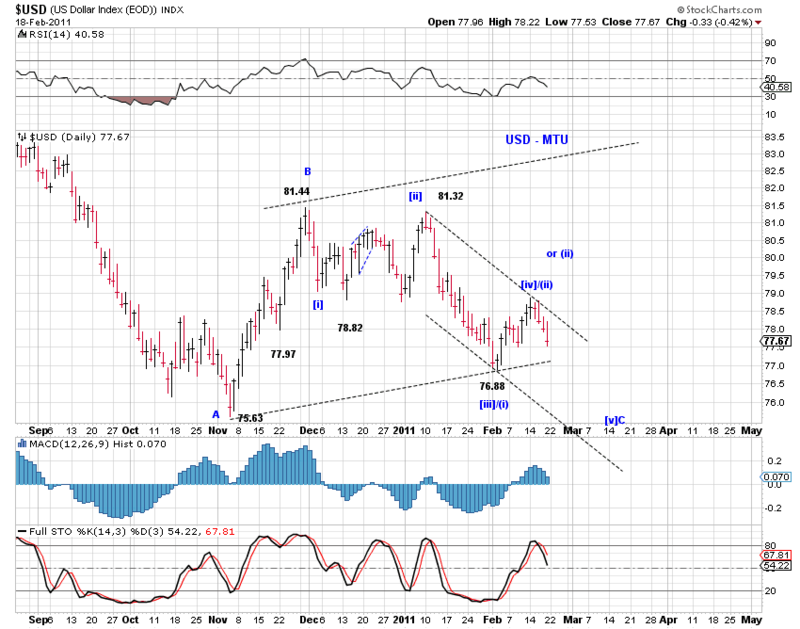 In other words, the USD index is still completing its lengthy primary wave  down - see the blue count in Chart 10. 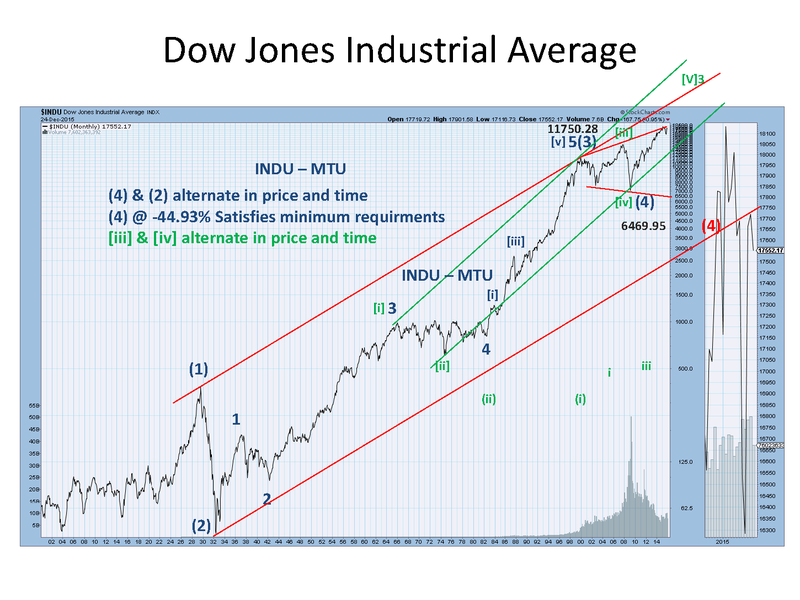 The red and green counts in Chart 12, as well as a potential multi-year triangle represent alternative possibilities. Chart 13 offers a near term count based on the primary count. If this count is correct, one should leave room for an extended wave [v] down to complete wave C of (Y) of .